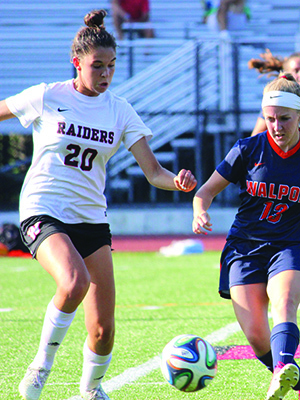 Wellesley girls soccer took some steps forward last season, finishing the regular season 7-6-3 and earning a preliminary-round victory against Durfee (1-0) in the Division I South playoffs. This season, the Lady-Raiders will look to build off of their success in 2017, but they will have to do it under first-year head coach Roger Bothe, as Cat Whitehill stepped away this past offseason. Leading the Lady-Raiders into battle in 2018 will be a pair of senior captains in Avery Mohan and Maddie Fleming, the latter of whom recently-returned from injury. Defensively, Wellesley returns an experienced group of players headlined by Abby Comella and Bella Kogon. At midfield, Wellesley features several key returning players in Bridget Noonan, Olivia Francis, and Mohan, all of whom should make significant contributions this season, according to Baker. “Olivia, Bridget, and Avery will be controlling the field and setting the whole team up for fluid transitions all season,” said Baker. At forward, Baker will serve as one of Wellesley’s core pieces making crosses from the right side, while Fleming hopes to return as one of the team’s top goal-scorers after missing all of last season with a concussion.